How to use Gann indicators in stock markets? Gann indicators are normally considered to be a lot more about mathematics and less about charts and technicals. Gann indicators are normally considered to be a lot more about mathematics and less about charts and technicals. However, Gann indicators have been used quite extensively in identifying opportunities in the stock markets, both at the index level and the stock level. Let us first understand the concept of Gann and the logic behind the Gann indicators. What is the basis of Gann theory? The above square is called the Gann square or the Gann Master Chart and is the basis of Gann based trading. This is not a random chart but is the number system that is created through concentric squares. See where the number 1 starts right at the centre and then gradually that pattern is followed all the way up to 81 where the 9X9 square ends. While this has been depicted for just 81 squares, you can expand it to 144 squares and so on. Essentially, if you look at the pattern of the consecutive numbers, it forms a spiral all the way from 1 to 81 with each spiral forming concentric squares/circles. The logical movement from 1 to 81 is in a clock-wise fashion. How to apply Gann Square in stock trading? The Gann Square of 9 is simply a tool that calculates time and price besides calculating the square root of numbers, including the mid points. The Gann Square basically looks for price and time alignments and is often used to forecast prices. Typically, the time alignment is used for swing trading, while the price alignment is used for forecasting prices and also for identifying supports and resistances of a stock. In the entire Gann Square, it is the numbers on the cross and the diagonals that are really important from a forecasting point of view. For example, since the Gann Square is a perfect square it can also be represented as a circle that perfectly circumscribes the four corners of a square. 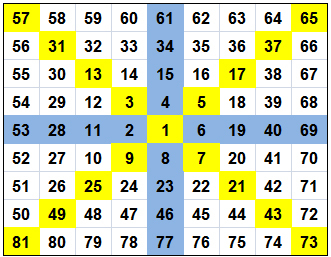 Once that is done, the entire Gann Square is broken up into 8 equal parts of 45 degrees each. Since the circle has an angle of 360 degrees, each sector of 45 degrees will constitute one angle for the Gann Analysis. From a price and time forecasting point of view, the two most important lines are the Cardinal Cross and the Ordinal Cross. Let us focus on this Cardinal Cross and the Ordinal Cross more closely. In the above chart, the blue lines represent the Cardinal Cross and the yellow lines represent the Ordinal Cross. They are next in importance and represent the important supports and resistance levels for stocks. Effectively, the numbers along the blue line (cardinal cross) represent the strong supports and resistances, while the numbers along the yellow line (ordinal cross) represent the strong supports, which are liable to be breached. Gann trading has never been proven to be scientifically workable but the patterns and the harmony in numbers that Gann has spoken about do have a lot of resonance not only in mathematics but also in most sciences ranging from trading, architecture, design, etc. If the high price or the low price of a stock or index is made on Friday (last trading of the week), the next week is likely to see higher highs and lower lows, respectively. In a strong uptrend, weekly lows are normally achieved on Tuesday, while in a strong downtrend the weekly highs are achieved on Wednesday. Four weeks (1 month approximately) is a good indicator of reliable breach. If a four week high is breached or if a four week low is breached then indications are of more highs or more lows, respectively. There are certain basic ratios that are held. For example, if the price trend is up for 9 days at a stretch then it is likely to correct for 5 days at a stretch (Ratio of 9:5). Double bottoms and triple bottoms on a monthly chart after a minimum gap of 6 months is an indication of a fresh uptrend. Similarly, double tops and triple tops on the monthly charts after a minimum gap of 6 months is an indication of a fresh downtrend. Normally, 50% of the last selling price is the strong support area for a stock. If it goes below that price then it is not useful for investment. In terms of application, Gann theory can be used to trace and interpret 3 kinds of distinct patterns. These include Time Study, Price Study and Pattern Study. While the applicability of the Gann approach by itself is doubtful, it is a very important step in understanding patterns in trading.